Water has started flowing again in the Diana, Princess of Wales Memorial Fountain, three weeks after it was turned off because of safety fears. The £3.6m fountain in London's Hyde Park had only been open two weeks when three people were treated in hospital after slipping inside the stone ring. It reopens to the public on 20 August after new safety guidelines were drawn up to manage the number of visitors. Running will be banned although people can still paddle and sit on the side. A few people watched from behind temporary fencing as the water was switched back on. Peter Sellers, 49, who was visiting from Halifax, West Yorkshire, said: "It's good to get it back in action. "I don't see why they had to say people could play in it. It's a memorial, it should be something that's only looked at." The fountain proved very popular when it opened and the huge public interest was thought to be the root cause of its problems. After the accident, health and safety experts, designers and engineers were called in by the Royal Parks and asked for advice. The report was also discussed with the Department for Culture, Media and Sport and a number of recommendations drawn up. Now fences have been put up to help manage the numbers of people using the fountain and six staff trained in crowd control and first aid will supervise the site in the summer. Signs explaining guidelines will be put up. 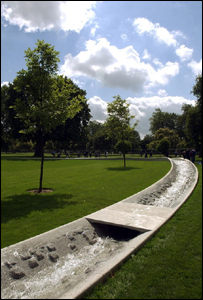 Greg McErlean, head of major projects for the Royal Parks, said: "We had to manage people's interaction with the memorial so that people would sit on the side and dabble their hands and feet but not walk, or in some cases run, around in it. "We want people to come and experience the memorial safely and happily." Culture Secretary Tessa Jowell said she was "delighted" the memorial was soon to reopen and was happy with the safety measures put forward. She added: "I am delighted that the memorial will soon reopen for everyone to enjoy as a special place of relaxation and remembrance." But another designer said the measures were just "a sticking plaster on a poor design". Rory Coonan, who designed Birmingham's Victoria Square Fountain, said: "This is one slippery fountain and I predict it will shut permanently in six months." "The fountain's backers say that it is a victim of its own popularity"
Will the fountain heal Diana families' rifts?